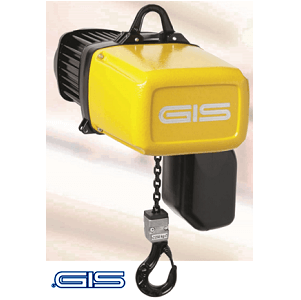 The GIS GPM Electric Chain Hoist is excellent for light load lifting. With a 250kg lifting capacity the GPM hoist is ideal for use in workshops and comes with a wide range of optional extras. The GIS GPM electric hoist started production in 2014 and is already gaining approval from users. 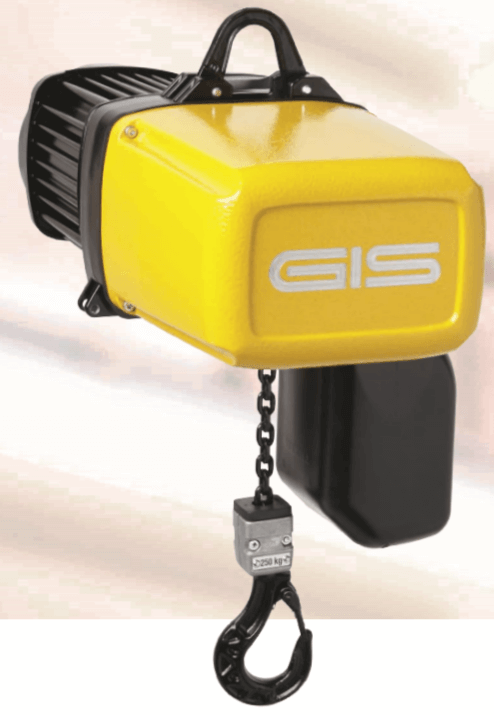 The GPM electric chain hoist is light in weight yet packs a punch when lifting loads. As with all GIS hoists, they are both safe and reliable, they are simple to use and easy to maintain. Lifting Hoists Direct can supply the GPM electric hoist with a lifting capacity of 250kg and with a single fall of chain. 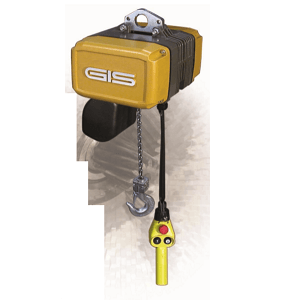 The GPM electric chain hoist has many features and options available including a single phase motor for single speed lifting or a 3 phase motor for dual lifting speeds. The lifting height of the hoist comes as a standard 3 metres; please ask if you require more lifting height. 1.8 metres is the standard length of the controller cable. Both hook or eye suspension types are available as are a range of operating powers; 3x 400v/50Hz; 3x 230v/50Hz or 3x 480v/60Hz; also 1x115v/50/60Hz & 1x 230v/50/60Hz.This unit has low voltage control at 42v. The GPM hoist has IP65 protection along with ‘F’ isolation class for the motor as standard. Other standard features include geared limit switch, DC spring brake system and a dry running slip clutch which is outside the drive train for convenience. There is also an emergency stop button on the ergonomic controller. The GPM boasts a minimum 1600 operating hours with a 40% duty cycle, 240s/h. The gearbox has permanent lubrication, further enhancing its ease of maintenance. The operation of the GPM is relatively quiet thanks to its three step drive and helical gearing. The load chain is phosphate coated case hardened steel which allows smaller chain diameters to be used which also lowers the overall weight of the hoist. 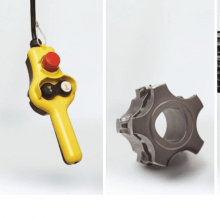 One of the biggest benefits to the GIS GPM is the innovative use of polygonal shaft – hub connections within the hoist’s housing. This system enables super quick disassemble for maintenance and reduces service costs. The GIS GPM electric hoist has no sensitive electronics which contributes to its normally long service life, even with heavy use. This hoist is perfect for use in mobile applications thanks to its low overall weight at 14 kg. 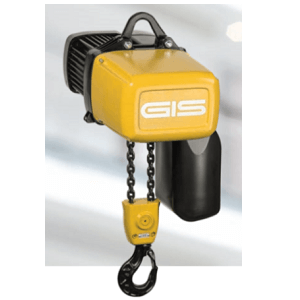 There are many optional extras and other accessories which compliment the GIS GPM electric chain hoist, and make it a truly versatile piece of lifting equipment. Always ask for any extras at the time of ordering. Lifting heights of up to 90 metres can be achieved. A locking load hook can be added for extra load safety as can the optional geared limiter switch with 2 extra emergency stops. A brake with a manual release can also be added. A range of push travelling trolleys is available to suit hollow aluminium profiles or steel girders / beams. Operating counters can be added as can different sized chain buckets, to suit the amount of chain you are using. Special grease can be used to enable the hoist to be used in low temperatures or the food industry. The ‘handy’ tool may be available to enable one handed operation as well as accurate positioning. 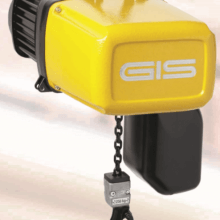 Overall the GIS GPM electric hoist is a versatile device and comes with a 3 year warranty. Order yours today, contact us here.